I am hooked on this new tip. When it comes to piecing together many small squares, there’s often little room for mistakes. 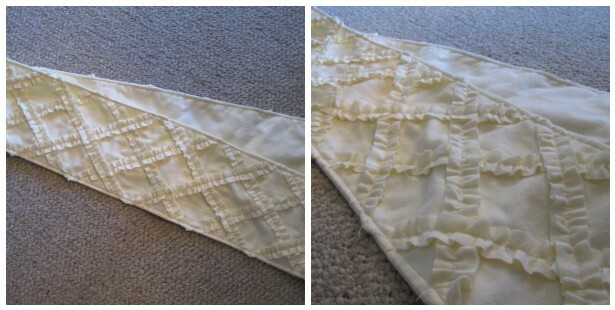 But, if you try out this method, you are basically guaranteed perfect patchwork squares. The genius behind this method comes from using fusible interfacing as a base to “glue” your squares in place before you even sew them. I’m not really sure how to explain how this works, but definitely check out the tutorial if your interest is piqued. The pillow above was made from 5″ Amy Butler squares that I purchased pre-cut about a year ago from Ebay. 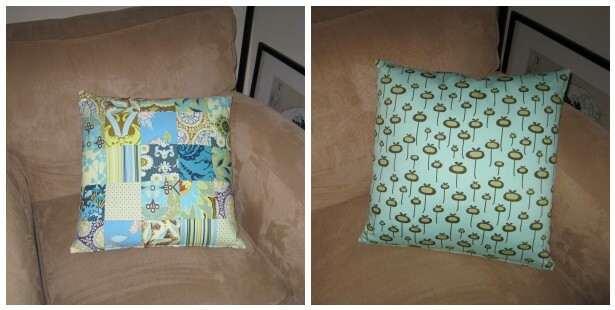 I backed it with an adorable Amy print, and finished off the pillow with a zipper-closure (see my tutorial here). Such a simple and rewarding project! This one was a Christmas present, but I plan to try this method again for some pillows to keep.